My oldest headed off the Kindergarten this fall. It seems the fall semester of Kindergarten begins with identifying colors and reading and writing color words. While I had a few favorite books for a color theme, I love adding other's recommendations to our reading. I asked readers to share their favorite books for exploring colors on my facebook page. One reader, Susan, suggested the book, "Monsters Love Colors". Susan's kids loved the book, and I knew my boys would too. I hurried off to the library to pick up a copy. It seemed like the perfect book for this time of year. After all, fall is not just the time kindergarteners head off to school to learn to read and write color words. Fall is also the time of year when monsters emerge. Monsters are all around in Halloween decorations and Halloween television shows and books. Kids will love getting to read this monster book this Halloween. We decided to take this book a step further and do some kids science with monsters. We created playdough monsters and experimented with color changes as we made new monsters, just like in the book! The story begins with three large, highly energetic, primary colored monsters. The monsters label their color and declare its greatness. Four gray monsters come along. They want to be changed into colorful monsters. With much mixing, dancing, squishing, and squashing, three new colors are made. There is one monster left, though, who gets a special surprise color at the end of the story. We did a monster science experiment with this book. We used play dough to explore how colors change. 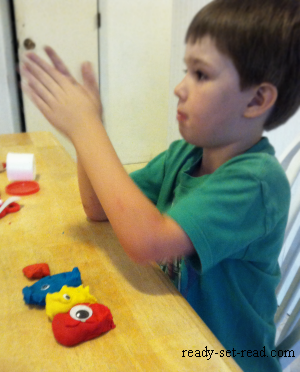 We began with the primary colors of play dough. The boys added wiggle eyes to create monsters. As we read the book, they pulled off a bit of the big monsters to make new monsters. 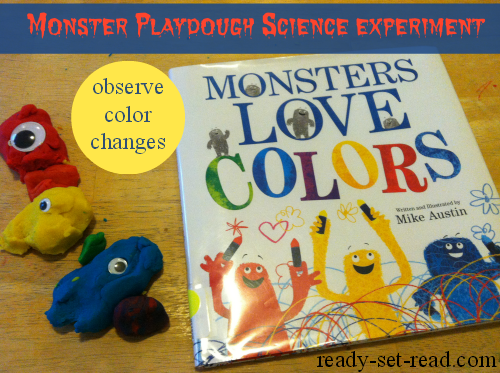 Play dough is a great way for kids to observe color change. It takes awhile to knead the play dough and kids can watch the change taking place. I would love for my son to practice writing in his journal every day. The expectations for Kindergarten writing has really grown in past years. To become better writers, children need lots of opportunities to write. Unfortunately, at the end of the day Logan doesn't want to journal, practice handwriting, or even draw or color. If we do science experiments and write about them in our science notebooks, though, he is super happy to write. He wants to be a scientist someday! There are many ways to draw and write about this experiment. Allow your kids to draw a picture of the monsters, write or draw an equation sentence (blue + yellow = green), paint the monsters and then mix the paint to form new monsters, label with color words, etc. Explain to children that all substances have certain properties that can be observed and that can be changed. What changes did we observe in the properties of the playdough? (Color change, size change, etc). Can we reverse these changes? Halloween is such a wonderful time for exploring science. Monsters Love Colors is a great seasonal book, but would also work year round for exploring colors. If you'd like more ideas for exploring science for Halloween, check out this pumpkin cano sensory science experiment by Little Bins for Little Hands. This book is great, you can do so much with it! I totally agree, Monsters Love Colors has so many opportunities for learning and luckily, my boys love it enough to read it a ton of times! Looks like a great book, and I love how you did the science experiment too! Thanks so much for sharing!! It's great that you found a way to encourage Logan to write. Anna is still a very reluctant Afterschool writer if pushed, but will do a lot of writing on her own in the flow of her games or creative pursuits. I love your suggestion for tying in writing with science! Thanks so much for sharing this at After School.